The Copper Mountain Solar Complex in Nevada is one of several clean energy projects aiding the state’s economy. Photo courtesy Sempra U.S. Gas & Power. OUTSIDE BOULDER CITY, Nev. -- Heading south on U.S. Route 95 from Las Vegas, drivers gradually become aware of a vast, shimmering presence far off in the distance. Continue on a few miles farther down into the valley, and the source of the shiny apparition becomes apparent. 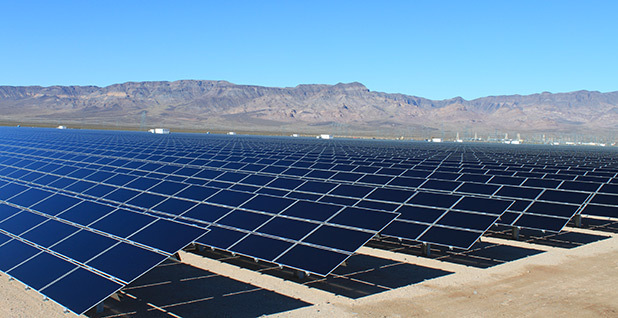 Tucked between the highway and the peaks of the McCullough Range is the Copper Mountain Solar complex, a sprawling collection of panels stretching across 3,000 acres of this high-desert valley. By catching the sun's rays -- and it's almost always sunny here -- the facility generates enough electricity to power 142,000 homes in nearby Southern California. For Senate Minority Leader Harry Reid (D-Nev.), the image of more than 4 million solar panels in the dry lakebed is a welcome and familiar sight. He grew up 25 miles to the south in the mining hamlet of Searchlight, Nev., and has been traveling this road his entire life. "It used to be in the hot desert you would drive -- I can still remember it -- you would see mirages," Reid recalled last month in an interview with E&E Daily on the sidelines of his eighth annual Clean Energy Summit in Las Vegas. "They were just so stunning. You would look out there, and there was a lake out in the middle of nowhere. It was a mirage, it really didn't exist. But now you see this thing that looks like a great big old mirage, and it's all these solar panels." The Copper Mountain facility is emblematic of Nevada's ongoing solar boom. Owner Sempra U.S. Gas and Power LLC plans to break ground later this year on an expansion at the site that would power an additional 41,000 homes. Overall, Nevada ranked third nationally for solar capacity installed in 2014, according to the Solar Energy Industries Association. The Silver State last year also led the nation in solar job growth on a per capita basis. Copper Mountain's proximity to Searchlight is also fitting, given Reid's oversized role in steering Nevada on the path toward a clean energy economy. Using his twin positions as Senate Democratic leader and the top figure in the state's political structure, Reid for more than a decade has patiently and deliberately wielded his clout to push policies that encourage the development of clean energy at home. The results are evident throughout the state, where solar panels in some areas are as ubiquitous as casinos. Nevada has also been steadily tapping its substantial underground heat sources to make electricity, accounting for almost a fifth of U.S. geothermal energy in 2014, according to the U.S. Energy Information Administration. And outside Reno, Tesla Motors Inc. is building a $5 billion "gigafactory" to mass-produce the lithium-ion batteries for its electric vehicles. Winning the race to host the facility was a major victory for Nevada, one of five states that competed for the site. Nevada's successes in the burgeoning clean energy market has resulted from government actions at the federal, state and local levels, but the driving force behind the push has always been Reid, whose fingerprints are all over the billions of dollars of private and federal clean energy investments the state has attracted in recent years. "It's all Reid," said Nevada political commentator Jon Ralston in Las Vegas last month. "This never would have happened without Reid. There's no question about it." But with both Reid and his key ally, President Obama, poised to leave office in just 16 months, there's signs of trouble ahead for the clean energy legacy both men have labored on for years. Nevada is currently embroiled in a heated dispute over net-metering policies that solar developers say threatens the state's booming rooftop solar industry. Making matters worse are questions over the future of a key federal tax break for solar, which expires at the end of next year, as well as Obama's climate agenda, which provides the long-term policy signals the renewable industry says are needed, but which is under attack by GOP critics on multiple fronts. Reid, 75, may be a lame duck, but don't expect him to act the part for the rest of his final term. Reid's resolve was an asset for him on the school's football and baseball teams, O'Callaghan wrote in the foreword of Reid's 1998 history of his hometown, "Searchlight: The Camp That Didn't Fail," in which he recalled the future Senate majority leader as "determined," but "not a great athlete." "He became good through tenacity," O'Callaghan wrote. "Harry was not the biggest or the fastest player, but he displayed grit, eagerness, and a fierce competitive spirit that more than made up for his physical limitations." O'Callaghan suggested that a second Reid hallmark may have originated from his experiences accompanying his miner father deep underground as a small boy. "He had no fear," he wrote. Despite his meager roots in Searchlight -- his family's home lacked indoor plumbing -- Reid's sharp intellect eventually earned him a law degree. He entered politics in 1968 with his election to the Nevada State Assembly, and just two years later, he became the state's youngest lieutenant governor at age 30. Even though he won more votes that year than his running mate, O'Callaghan, Reid in 1974 narrowly lost in another statewide campaign -- his first Senate race. The following year, Reid was soundly defeated in his bid to become Las Vegas mayor. O'Callaghan later appointed his protégé as chairman of the Nevada Gaming Commission, a position Reid used as a springboard to win election to the House in 1982. After two House terms, Reid in 1986 won the race to replace the retiring Sen. Paul Laxalt -- the Republican who had bested him for the seat 12 years earlier. When Congress in 1987 directed the federal government to only consider Yucca Mountain -- which lies just 90 miles northwest of Las Vegas -- as the final resting place for the nation's spent nuclear fuel, Nevada lacked the political clout to stop the legislation. But in the Senate, Reid soon found himself a seat on the powerful Appropriations Committee, from where he began to systematically attack funding for Yucca Mountain. As Reid's seniority in the Democratic caucus rose, so did the toll on the Yucca project, which saw its annual appropriations dwindle. Reid also took the long view with his maneuvering against Yucca. As the No. 2 Democrat in the Senate, he negotiated a deal with the George W. Bush White House that led to his former aide Gregory Jaczko being installed on the Nuclear Regulatory Commission. After Obama made good on his campaign pledge to end the Yucca project, Reid -- who became the Senate's top Democrat in 2005 -- later persuaded the president to designate Jaczko as NRC chairman, effectively putting a staffer with a long history of working against Yucca Mountain in charge of the agency that must license the facility. Jaczko resigned in 2012 after a tumultuous tenure as chairman, including complaints from Republicans that he was doing Reid's bidding on Yucca, along with allegations from other commissioners that he created an abusive work environment. Whether Yucca is "dead," as Reid maintains, or simply on life support until the post-Reid era remains to be seen. But it's hard to dispute that over the course of his Senate career, Reid has singlehandedly brought the nation's nuclear waste strategy to a standstill over the objections of Congress and the nuclear lobby. With the same foresight and determination he used to put the Yucca project in a coma, Reid has spent his decade as Democratic leader positioning Nevada to become a clean energy power. Early on in the Bush administration, Reid began to write bills intended to provide the long-term policy certainty sought by renewable energy developers. From his appropriations perch, dollars began to flow home to boost development and research into renewables at Nevada universities. An early focus of those efforts was tapping into the state's abundant geothermal resources, which first left an impression on Reid decades ago. "You go to northern Nevada," he recounted last month. "I went there for the first time as a city attorney going to the Legislature, 1964, '65. And I saw this steam coming out of the ground. ... What the hell is that? I'd not been to Yellowstone, I didn't know anything about that. It was geothermal heat coming from the Earth. And now we're the largest producer of geothermal in the country." Reid also worked to untangle the bureaucratic red tape that stood in the way of renewable development in his state, 80 percent of which is owned by the federal government. For example, in 2007, he gathered the heads of key federal agencies to identify areas in Nevada with the most potential for developing renewables. With Obama's election to the White House and a Democratic-led Congress, Reid in 2009 found a legislative opening to go big on renewables. The economic stimulus contained tens of billions of dollars in spending for clean energy, including proposals favored by Reid such as an extension of the renewables production tax credit, a popular grant program for renewable developers, an expansion of the federal loan guarantee program intended to boost large-scale renewable facilities, as well as billions of dollars in federal assistance to build new transmission lines to connect new wind and solar plants to the existing grid. Additionally, the Obama administration quickly made deployment of renewables on public lands a top priority. Then-Interior Secretary Ken Salazar appeared with Reid in Nevada in 2009 to announce a series of initiatives to speed development of solar on public lands. Reid-favored nominees soon began to appear at key slots in the federal bureaucracy, including Nevada attorney Jon Wellinghoff, whom Obama named chairman of the Federal Energy Regulatory Commission in 2009, where he pushed policies to promote the integration of renewables into the electric grid. At Reid's urging, Obama in 2009 nominated Nevadan Bob Abbey as director of the Bureau of Land Management, where he led efforts to spur utility-scale solar projects on public lands. When Abbey retired in 2012, the White House turned to another Nevadan to fill his shoes at BLM -- Neil Kornze, a former Reid aide who currently holds the job. Jennifer Taylor, the executive director of the Clean Energy Project, a Nevada nonprofit that co-sponsors Reid's Clean Energy Summit, credits the senator for recognizing the economic potential for a state awash in renewable potential but lacking fossil fuel resources. "Many years ago, Sen. Reid really understood what Nevada and the West could be and should be because of our abundant resources and because of the lack of fossil fuels and really started driving a vision forward to make that a reality," she said in an interview at the group's Las Vegas headquarters last month. The economic impacts of Nevada's clean energy push extends far beyond the $6 billion Reid's office recently estimated has been invested in the sector in the state. Driven by growing demand for renewables, Nevada is increasingly exporting energy to neighboring states such as California. By diversifying its economy, Taylor says Nevada is to reverse its long-standing reliance on energy imports from other states to meet its need. "For the longest time, we sold entertainment, and we sold minerals because we had a lot of mining," she said. "But now we have the opportunity to sell this abundant resource, and it only makes economic sense that that be developed, and it is being developed." Reid also hasn't been shy about inserting himself into state politics to further clean energy. In 2012, he used the bully pulpit of his annual Clean Energy Summit in Las Vegas to call for the closure of the Reid Gardner Generating Station, a coal-fired power plant adjacent to the Moapa River Indian Reservation northeast of Las Vegas. The following year, Reid brokered a deal with NV Energy Inc., the state's largest power provider, that set a schedule for a phasing out coal-fired generation within Nevada, while also boosting the state's renewable energy mandate. Ralston said the resulting legislation, passed by the state Legislature and signed into law, was classic Reid. "For him to insert himself into that legislative battle in 2013 in the way that he did was really quite astonishing," he said. "That was his bill. He had his people calling Democratic state senators to tell them what to do, to tell them what he wanted. He has been very involved in talking with NV Energy, both rhetorically, attacking them from his bully pulpit and privately negotiating with them because that's the way Harry Reid does business. He's expended a lot of capital on making this state more and more progressive when it comes to renewable energy." Reid last month took advantage of the spotlight at his eighth annual summit to take NV Energy to task for its position in the state's fight over rooftop solar. "If NV Energy continues on the path they're on, they're going to wind up losing," he told reporters, as the Nevada Public Utility Commission weighed its options for the state's popular net-metering program, which meet a legal cap months ahead of schedule. A few days later, the commission extended the program's existing rate structure through the end of the year, rebuffing proposals by the utility to reduce the value of the surplus solar that homeowners are paid for feeding into the grid. While the decision buys more time for rooftop solar in Nevada, Reid quickly urged stakeholders to negotiate a deal "empowering consumers and maximizing the value of Nevada's enormous renewable energy resources" (E&ENews PM, Aug. 27). As minority leader, Reid no longer controls the Senate agenda. But with 16 months left in his storied Senate career, he's still looking for opportunities to help clean energy interests, including a possible bipartisan compromise that would allow for crude oil exports if renewables get a lift, too (Greenwire, Aug. 25). Reid is reluctant to talk about his accomplishments but acknowledges some personal satisfaction in seeing a clean energy economy rise in Nevada and elsewhere. "I know that it's taking more than what we do here in Nevada and around the country, with what little renewables we've done, but for me it's a lot," he said. "If one looks around and see's what's going on with the world with the crunch of climate change, fires burning, and to have the -- I can say this because it's how I feel -- the Koch brothers-driven Republicans, denying that it exists, it makes me feel that I've done my little part in rejecting this 'it doesn't exist.'"